On Monday divers went down to an ancient shipwreck on a mission to bring up the Antikythera mechanism. I know what you are thinking, well maybe I know what you are thinking. 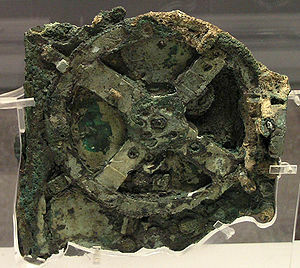 What the heck is the Antikythera mechanism? Well put simply it is the oldest computer in the world. But what was it used for? No cat videos were watched with the mechanism, but it was used to read the stars. Now this may seem like it is not that big of a deal but at the time the stars were all man had and some wild myths and religions were made through watching the movements of celestial bodies. This computer made it possible to travel the seas when the horizon vanished and the ships captain could only see stars this was the type of tool that kept the ship on track. It was ideas and tools like this that lead enlightened men and women to know that the earth was round. This tool and this idea really moved man out of the stone age. I think it is maybe philosophical that man could not move on until, he looked beyond himself and his world. It is so important to look beyond our own lives and experiences to help us move forward. You are part of a big world and a much larger universe! Embracing our place in all of this will make the impossible possible. Looking outward will force you to look inward and then grow. We should never forget our spot in the universe and always explore and look forward.